I used to dread cleaning. Somehow, I’ve started enjoying it because the reward is so great. Who doesn’t love a clean house? Now that my baby is playing on his own some and with his older brother, I find it to be so much less stressful. I set the boys up with some fun in the room I’m cleaning and go to town. Cleaning is the gift that keeps on giving in more ways than one. First, it’s a never-ending job, so we’ve had to find a way to make it work with the kids. And second, a clean house feels SO good before it turns into a messy house again. Every time we think we have a clean house, the cycle starts all over, but we’ve found some really good tricks and tips to help make cleaning a bit easier in our home. Here are 20 cool cleaning shortcuts we use and love. Fluff jeans and jumpers in the dryer before wearing instead of rewashing. I love extending the wear of clothes, saving myself at least one load of laundry a week. Add a couple of drops of essential oil to the dryer filter to really freshen things up – lemon, lavender and grapefruit are all gorgeous. Keep baskets for toys everywhere. We keep baskets all over our home so that toy cleanup is quick and easy. Have “go backs” baskets in every room. Quickly put any odds-and-ends in a small basket and use the basket to return things to the proper places in the house. This works especially well before you have guests coming by. Keep all-in-one cleaning wipes on every floor of your house. I keep dust wipes around for dusting, baseboards and floors. Clean the microwave quickly and naturally. Scrub the inside with lemon quickly, and then put a mug filled with half water, half white vinegar in the microwave and run it for thirty to sixty seconds. Let it sit to steam-clean for forty-five minutes while you clean other parts of the kitchen. Wipe it down. Fresh and clean! Use baby wipes to clean your stainless steel. Unscented baby wipes work great for so many things, but are particularly effective on stainless steel. Easily remove stickers with a blow dryer. If you’re a mum, you’ve likely dealt with stickers on your furniture, windows, clothing, and everywhere else—or you will soon enough. Try running a blow dryer on the sticker before attempting to remove it. The heat softens the adhesive and can make for a smooth removal of the sticker rather than you having to spend time scraping it off. Eucalyptus oil works well to get the last little bits of sticky off easily. Keep a vinyl or plastic mat on the floor anywhere your kids eat. Try placing a plastic or vinyl mat under the high chair to protect hardwood floor cracks or carpet from messy toddler food mishaps. Or, if you have a dog and are serving food that is safe, consider letting the dog enjoy the food scraps. Clean the bathroom while your kids are bathing. Why not wipe down counters and the bathtub while the kiddos are enjoying a nice bubble bath? Obviously, this isn’t safe with a baby, but with older toddlers or preschoolers, it’s a great option for getting the bathroom cleaned up. Grab a cloth and go from the counters down to the floor. You’ll be amazed at all you can accomplish in just a few minutes. Disinfect the cloth once you’re done. Employ your kids to clean your sinks. We make cleaning the sink a fun family activity. Our three year old LOVES to clean the sink. We simply sprinkle baking soda all over, give him a cup of vinegar, and let him pour it. He enjoys the noise and bubbles, then scrubs with a sponge. We finish it off with a good spray down, and we have a kids’ activity turned into a clean sink. Quickly freshen up your carpet. Did you know you can sprinkle bicarbonate of soda on rugs and carpets before vacuuming? This can help with pet odours or an unfortunate potty training accident. Clean toys and brushes in the dishwasher. Bath toys, plastic toys, rattles, dummies, brushes, and more can be cleaned in the dishwasher. A good steam clean will help disinfect these things with the push of a button and absolutely no elbow grease on your part. Hooray! Line the bottom of your oven with aluminum foil. Keep aluminum foil on the bottom of your oven or on the lowest rack of your oven under your foods. Anything that drips out will land on your foil, which you can remove and replace easily. This means fewer oven cleaning jobs each year. Freshen up your garbage disposal. We throw a few slices of lemon and a few ice cubes in our garbage disposal at least once a month and any time we notice bad smells. Run cold water and flip the switch to on. The ice sharpens the blade and the lemon freshens up the garbage disposal. Quickly clean your blender. Simply put one drop of dish washing detergent and 1 cups of water in your blender. Run the blender for ten to twenty seconds. Rinse and call it good. Disinfect your dishwasher. Remove all dishes. Pour one to two cups of white vinegar in the bottom of the dishwasher. Run it on your normal cycle. Voila! Use your stove to freshen up your entire home. If you’re having guests over and want to quickly freshen up your home, mix a pot of water with three or four drops of your favourite essential oils. Simmer for thirty to forty minutes or keep it going as long as you want to. Vanilla essence works well if you don’t have any essential oils. Get your toilet to clean itself. Put bicarbonate of soda in the toilet the night before your cleaning day. The toilet will come clean quickly. Disinfect your sponges. We go through sponges so quickly since we use them for everything. We love to zap them in the microwave for thirty seconds to get rid of any germs. It definitely helps us to use them longer and saves us money. Employ the five-minute cleanup rule. Okay, this one isn’t really a hack, but I’ve found it to be my best tip. We spend five minutes every evening tidying up the kitchen and family room, the rooms we use the most often. It makes a big difference in making the house feel clean, and you will be amazed at what you can accomplish in five minutes. Truly. I know there are so many other genius ideas out there. Please share. What are your secrets to quickly cleaning your house? Jessica Flannigan is a Minneapolis-based freelance writer, blogger, event stylist, photographer, wife and mother of two wildly active boys, Bodhi (3 years) and Ezra (4 months). 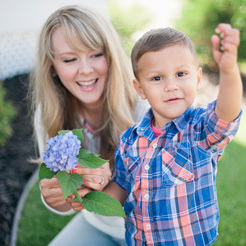 As a boy-mama, Jessica is obsessed with finding the latest and greatest fashion for boys and is currently working to stay stylish on her maternity leave. She is always looking for adorable styles for hip boys and mums on the go. Jessica is also a home design and do-it-yourself lover. 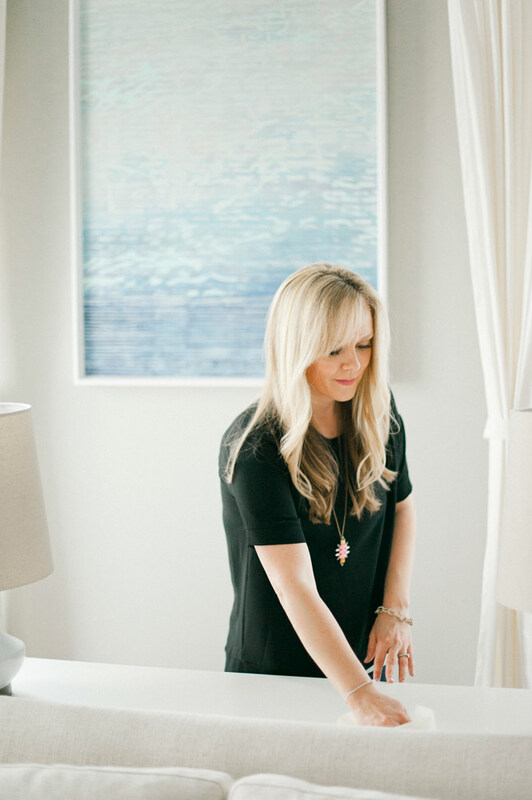 She shares her latest home improvement and event planning projects on her blog, Live the Fancy Life and fashion finds on her boy fashion site Oh Boy Style. You can connect with Jessica on Facebook, Pinterest and Instagram.